Gingery, salty, savoury and good; this Asian noodle soup recipe is something I muddled around with when I lived in London and frequently found myself in need of something comforting to protect against the long dark wintery nights. This warm, spicy noodle soup is the equivalent of a cuddle for your tummy and brightens up the most blustery, cold mid-week evening. So if your tummy feels in need of cuddling, go no further. And now to get started…. Pour the stock into a saucepan and put it over a low heat. You want to gently heat it so it is warm but not boiling, and it can just sit there heating up while you get on with the rest of the soup. Heat a wok over a medium-high heat and add a little vegetable oil, or spray with an oil spray, just to stop things sticking. Peel and slice the garlic and cut up the chilli, de-seeding if you don’t want too much heat (I usually leave a few seeds) and add these to the wok. Grate plenty of ginger, at least a tablespoon, into the wok. Leave it all in there to heat up and start to sizzle. Whilst the garlic-chilli-ginger trio is doing its thing, slice up the green vegetables and de-seed and slice the pepper into strips. When the contents of the wok are getting nice and fragrant, add the greens and pepper strips and stir about a little. If you have decided you are feeling carnivorous, turn the heat up a bit and throw in the beef ever so quickly, just to brown it a little. This is because you are about to add the stock, and you don’t want the beef getting too tough before the stock has a chance to poach it gently. So, carnivorous or not, at this point, ladle the warmed stock from the saucepan into the wok. Add about half a tablespoon of soy sauce, 4-5 drops of seasame oil and a squeeze of fresh lemon juice and stir it all into the contents of the wok. You may be thinking I have forgotten about the carrot, but not so! 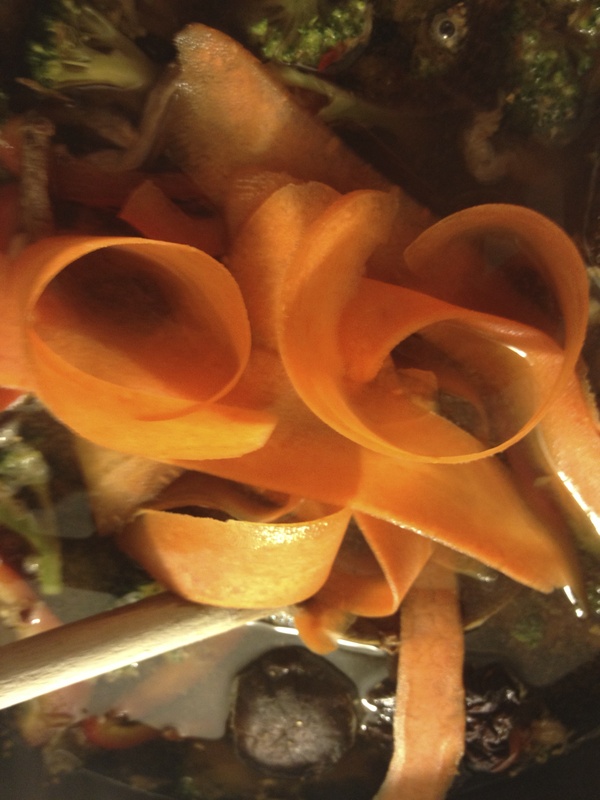 Using a vegetable peeler, peel ribbons of carrot into the soup. I add the carrot at this point so it doesn’t get too soft. Finally, add your dried mushrooms, using your spoon to hold ’em under for a little while if need be. 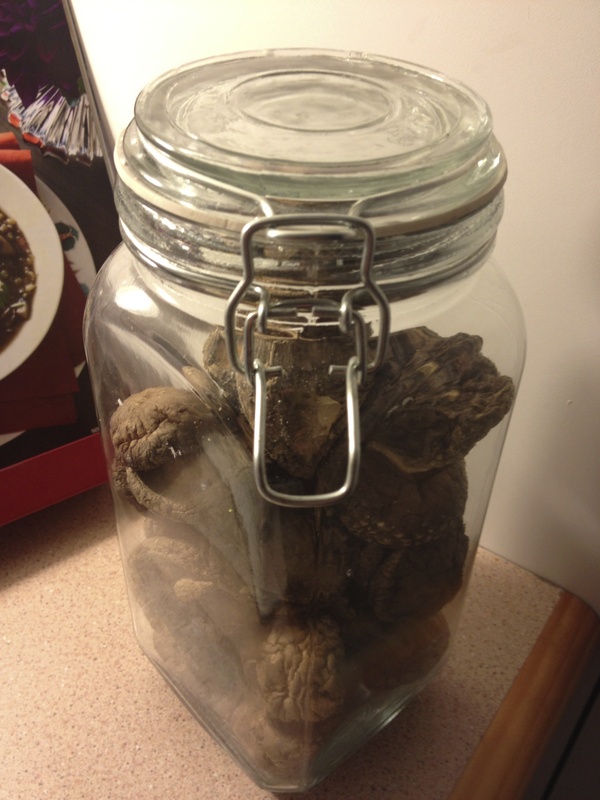 These mushrooms can be a little stinky and fusty-smelly for some, and for this reason I keep mine in an airtight jar. They have a lovely strong, savoury flavour however, and add a delicious depth to this dish, and I’d never make it without them. Turn the heat down to low and let the soup simmer away gently for 15-20 minutes, without letting it boil. About five minutes before you serve, prepare the noodles (at least, do them this way if you are using the wet, prepared packaged ones like I do). Boil the kettle and place the noodles in a heat-proof bowl. 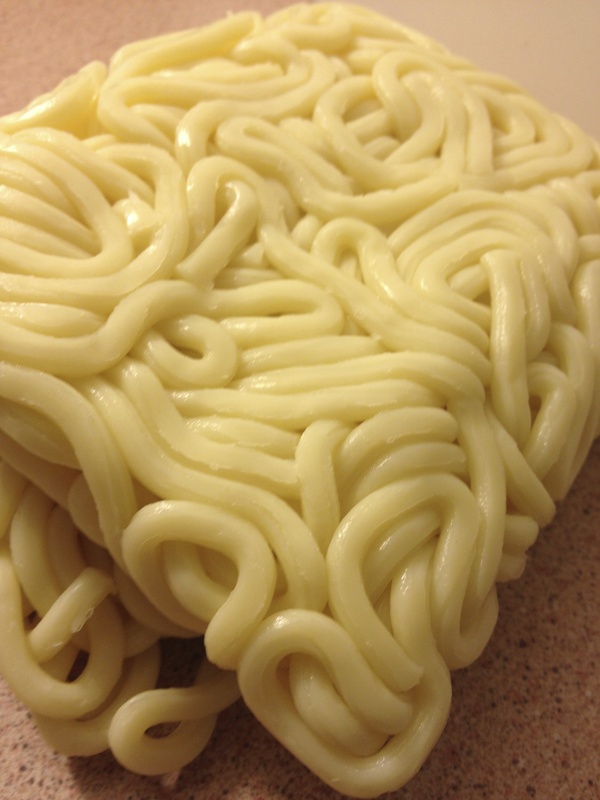 Pour the boiling water over the noodles and let them sit for up to five minutes. Use a fork to shake them up and separate them a bit, and then divide between two deep bowls. 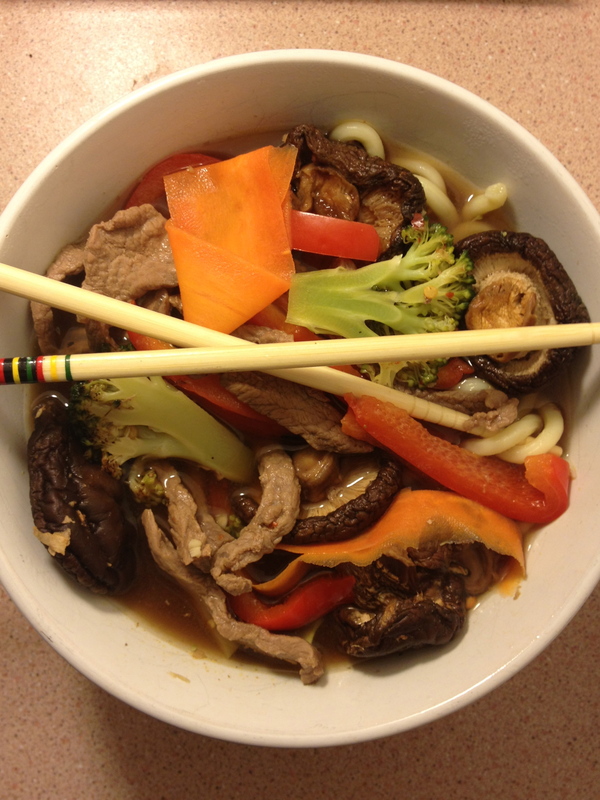 Ladle the soup over the noodles in each bowl and you’re ready to go. Tuck in and be comforted! Here’s the ingredients and method in one go, unbroken by pictures, for your ease of use…. Pour the stock into a saucepan and put it over a low heat. You want to gently heat it so it is warm but not boiling, and it can just sit there while you get on with the rest of the soup. 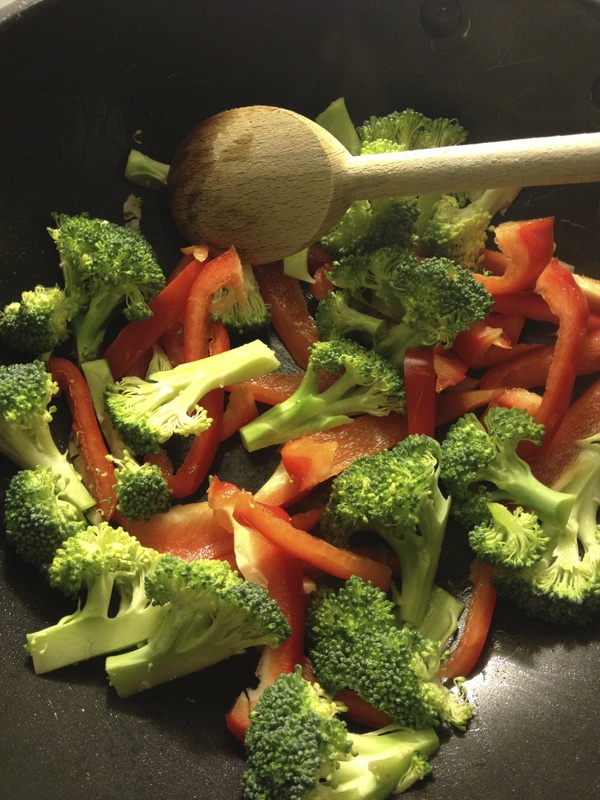 Heat a wok over a medium-high heat and add a little vegetable oil, or spray with an oil spray. Peel and slice the garlic and cut up the chilli, de-seeding if you don’t want too much heat (I usually leave a few seeds) and add these to the wok. Grate plenty of ginger, at least a tablespoon, into the wok. Heat. Slice up the green vegetables and de-seed and slice the pepper. Add to wok and stir. If you using beef, turn heat up, add to wok and brown briefly. Ladle the warmed stock from the saucepan into the wok. Add: half a tablespoon of soy sauce, 4-5 drops of seasame oil and a squeeze of fresh lemon juice; stir into contents of the wok. Using a vegetable peeler, peel ribbons of carrot into the soup. I add the carrot at this point so it doesn’t get to soft. About five minutes before you serve, prepare the noodles by placing in a heat-proof boil and covering in boiling water, let sit for up to five minutes. Divide noodles between two deep bowls. Ladle the soup from the wok over the noodles in each bowl and serve.